Most people agree that ribs are delicious when cooked well, yet rather horrendously dry when overcooked in the oven. 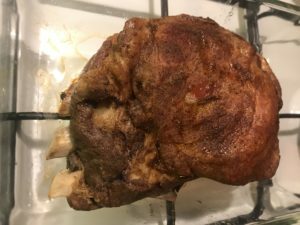 Well, here we pre cook them in a CrockPot until the meat starts falling of the bones and then move them just briefly into a hot oven to finish off the dish. Season the pieces of meat generously on all sides, put them in the CrockPot and cook on low heat for 10 hours. Carefully move the ribs to an ovenware and let them rest for a few minutes locking the moisture into the meat. Turn oven on high and put the ovenware with the ribs in the middle of the oven for 20-30 minutes. Check them regularly after the first 20min, You want them slightly crisp, yet not burned or dry! 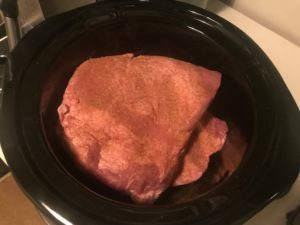 While the ribs are finishing cooking in the oven, pour the meat juices from the CrockPot through a sil into a smaller pot and bring to a boil on the stove. 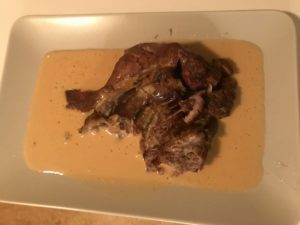 Let simmer for 10-15min to reduce the fluid and let the taste concentrate, then add heavy cream to taste and continue to simmer for the sauce to thicken (for a thicker sauce use a small amount of Konjac root flour). Serve the ribs with just the sauce or add a side of Your choice!